Why Does My Baby Wake Up At 3 A.M.? The witching hour. Sleep regression. Whatever you call it, early morning wakings can be the bane of any parent’s existence, especially when the alarm is set to sound just an hour or two after your baby begins crying. To better understand why your baby is waking at the literal crack of dawn, you need to understand a little more about humans and sleep. You’ve likely heard about melatonin and its involvement in the sleep process, helping to balance circadian rhythms. When it comes to sleep, melatonin is like a warm bath, relaxing us and getting our brains ready to rest. On the flip side, our bodies release the hormone cortisol about three hours before our natural wake time. Cortisol acts as a stimulant and is released during times of stress, but also acts as our body’s way of waking itself up. Even with your baby’s cycle of melatonin and cortisol release — which can be working perfectly –, there can be some mishaps. Once your baby’s body begins releasing melatonin in preparation for sleep, there is only a small window of time for your baby to fall asleep. If your baby misses their melatonin window, their tiny body responds by releasing cortisol, which is why you’ll sometimes notice a surge of energy and wakefulness when it’s supposed to be bedtime. Now that you know how this cycle works, you can better understand the 3 a.m. wake up. Remember that your body begins releasing cortisol three hours before your natural wake time. 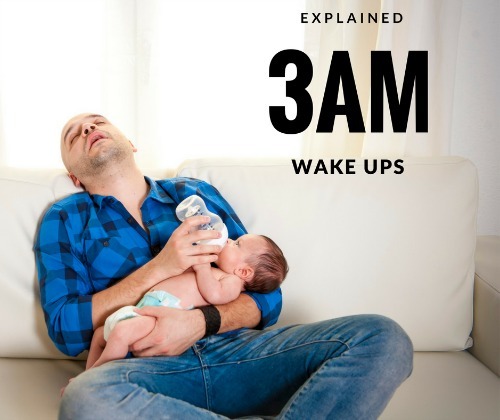 If your baby’s circadian rhythm puts their natural wake time at 6 a.m., 3 a.m. would be the approximate time that their body stops releasing melatonin and begins to release cortisol. When the release of cortisol corresponds with the end of a sleep cycle, your baby will more than likely wake. However, babies who possess the skills to self-soothe and go back to sleep will wake but eventually drift back to sleep without a fuss — much like we adults do every night. Those babies who haven’t yet developed independent sleep skills, or who rely on a sleep prop, will wake fully and begin crying when they can’t fall back to sleep. I’m often called by panicked parents who are desperate to “fix” their baby’s sleep problem. If your baby hasn’t developed the skills to sleep independently, and are thus waking early, then nothing is broken, it’s simply not yet learned. This is where the work comes in. Know that your baby’s sleep isn’t going to be solved overnight, but know that you can take steps each day to help your baby learn how to sleep independently — and soundly. I can’t say this enough — create an environment conducive to sleep. If you’ve not already, start by making necessary changes to your baby’s nursery. Add blackout curtains or shades to ensure that your baby’s room is nice and dark — perfect for encouraging continual melatonin release through the night. Remove the ceiling projectors and any other bright or shiny items that may stimulate your baby — you want your baby’s nursery to be boring so that they’ll want to sleep. 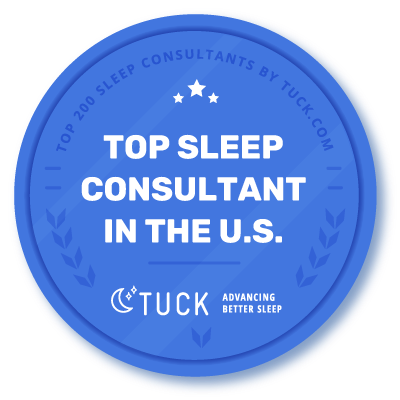 Finally, make sure that you’re committed to a consistent and predictable sleep schedule. Keeping a consistent sleep routine can better train your baby’s body to work in tandem with their natural circadian rhythm. And most importantly, make sure you’re teaching your baby the skills they need to sleep independently. If you’re unsure how to teach your baby to sleep independently, give me a call. I offer a free 15-minute evaluation so I can get to know the specifics about your situation, so book a call now.